Commercial Recreation Specialists is Serious About Fun! We provide winning recreation solutions including commercial-grade Waterfront/Pool Inflatables from Wibit™, Aquaglide® and RAVE Sports®, AquaClimb™ Pool and Waterfront Climbing Walls, Kayaks, Stand-up Paddleboards, Pool Slides, Custom Docks, Splashpads®, Miniature Golf, Playgrounds, SoftPlay, Site Amenities, Shade Structures, Lightning Detection Systems and much more. Do you have shallow water that is being under-utilized? 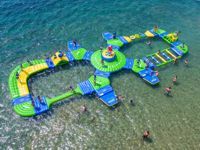 The New Wibit KidsZone will turn your shallow water into a revenue generator. It is specially designed for a low water depth, making it accessible to families with kids of all ages and abilities. Your guests will race, climb, jump & slide their way through the infinity track, for endless hours of fun. Generate excitement, attendance and revenue for your facility by getting your KidsZone today!